You’re the wild child of the family, but that doesn’t mean you don’t have a sentimental side! 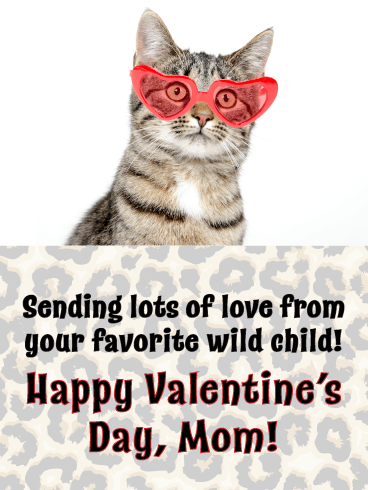 This cool cat is wearing a pair of heart-shaped glasses, helping to wish your mom the “purr-fect” Valentine's Day! 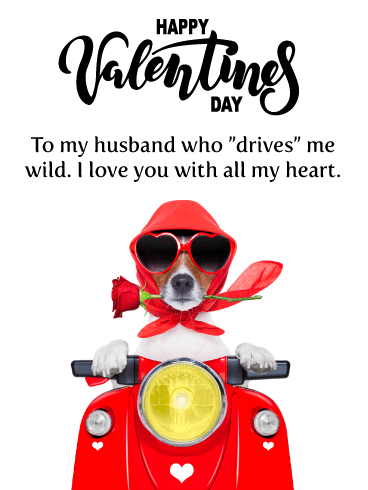 The fun animal print below adds to the whimsy of this card, which will have her smiling and laughing, knowing it came from you. For a friend with the sweet and sassy style, you’ll need a Valentine to match. 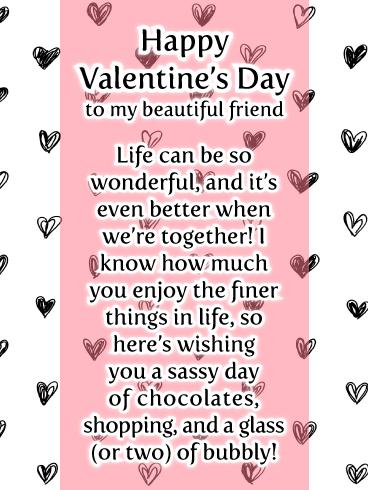 Send that fabulous soul the Sassy Style Happy Valentine’s Day Wishes Card, it’s sure to make them swoon with joy! Whether they spend the day shopping or working or celebrating with you, they’re guaranteed to do it with flair! A glass or two of bubbly couldn’t hurt either! Delightful heart decorations are joined by tealight candles and a gift wrapped up in red ribbon. Set against a charming wooden background, it sets a festive mood for wishing your mom a happy Valentine’s Day! 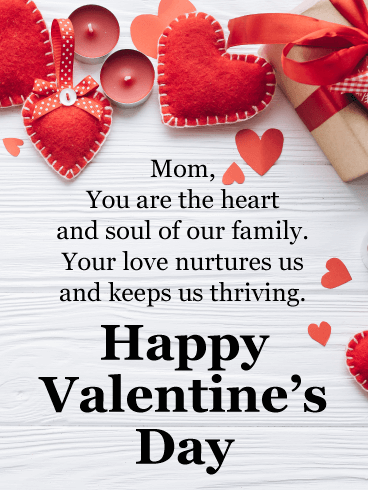 Even more special are the words, which let her know how her love is what nurtures your entire family and keeps everyone thriving. What’s even sweeter than a chocolate filled, frosting-topped cupcake decorated with hearts? The person who it’s made for: mom! 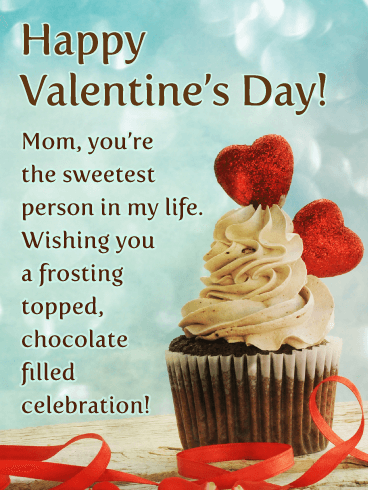 This Valentine’s Day, wish her a day of indulging in everything delicious with this delightful card featuring a yummy looking treat. It’s sure to be one she’ll always remember. 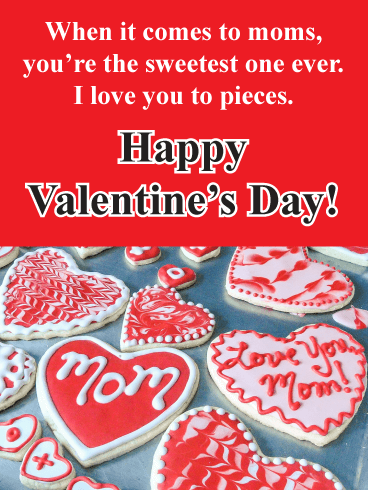 Let mom know she’s the sweetest this year with a　Valentine’s Day card full of frosted and beautifully decorated heart cookies! Each one is unique, just like her. 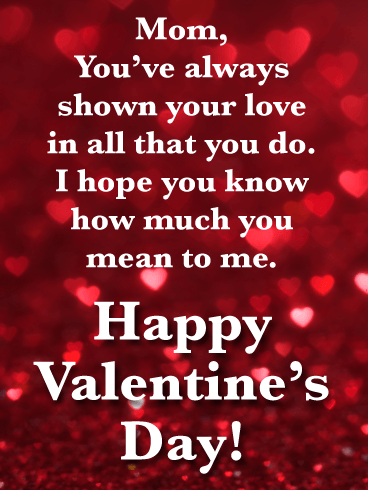 It’s a sentimental way to remind her how much you love her, not just on February 14th but every day of the year. No matter how old you get, she’ll always have your heart. So on Valentine’s Day, let your mom know with this touching card. A child’s hands hold a special gift, a keepsake heart that symbolizes all the love you have for the person who’s been there for you from the very beginning. Sparkly red hearts fill this special Valentine’s Day card for your mom. It’s the perfect backdrop for the meaningful words, which let her know how much you appreciate the love she’s shown in so many ways. No matter how far away you may be, this card will let her know she’s always on your mind and in your heart. 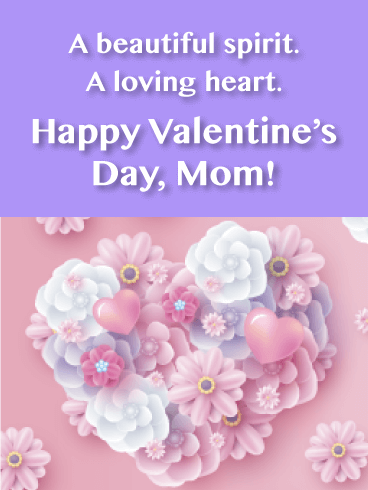 A gorgeous floral heart made up of pink, purple and white blooms is symbolic of how much love you have in your heart for the special person you call mom. The sweet color scheme of this touching card will make her smile, while the simple yet sentimental message will be one that stays with her always. 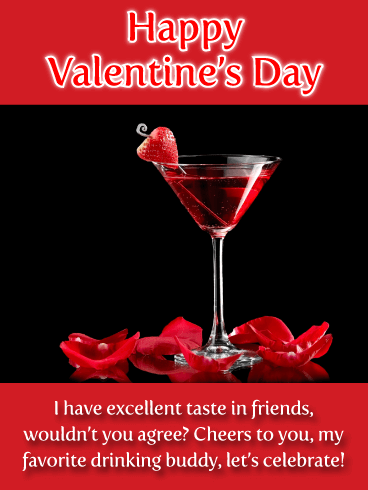 The Red Cocktail Happy Valentine’s Day Wish Card is both thoughtful and pretty funny! The cocktail looks luscious and delicious, while the message jokes that you have excellent taste in friends. Cheers to your friendship, may you have many more years of laughter and love together! Now get out there and celebrate, after you send your bestie this stunning card of course! 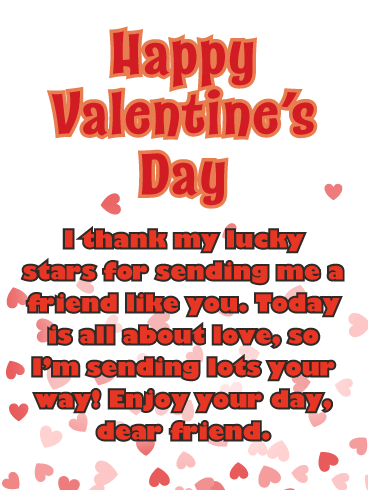 Once you get done thanking your lucky stars for sending you an awesome best friend, send that sweet darling this heart-filled card! 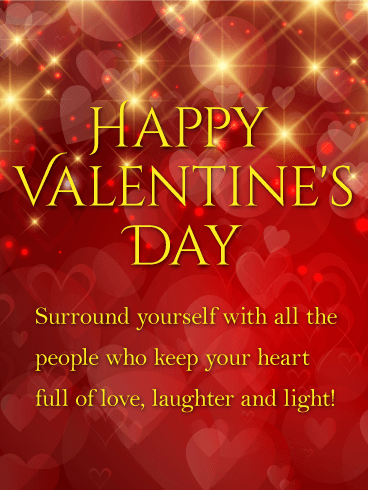 The Falling Hearts Happy Valentine’s Day Card wishes your good friend an enjoyable day. With the help of lots of love from yours truly of course! 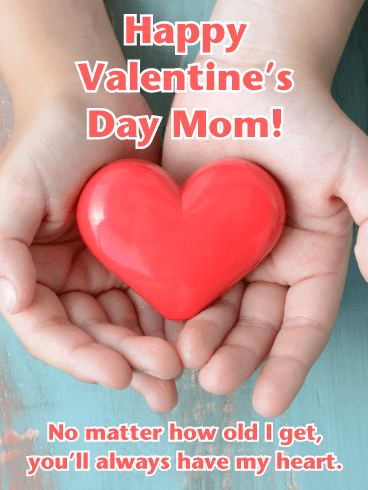 Valentine’s Day is all about the love after all, so pay it forward! 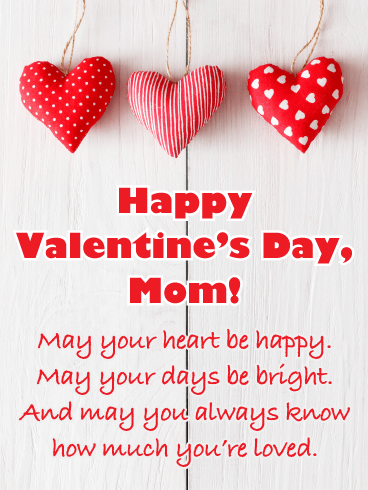 This charming and crafty card is a lovely way to wish your mom a very happy Valentine’s Day! Decorated heart ornaments are strung from the top against a rustic wooden background. And the message below will let her know you hope her heart is happy and her days are bright while reminding her that she is always loved.